By default all sources are allowed to register at the RP (Rendezvous Point) when using PIM sparse mode. 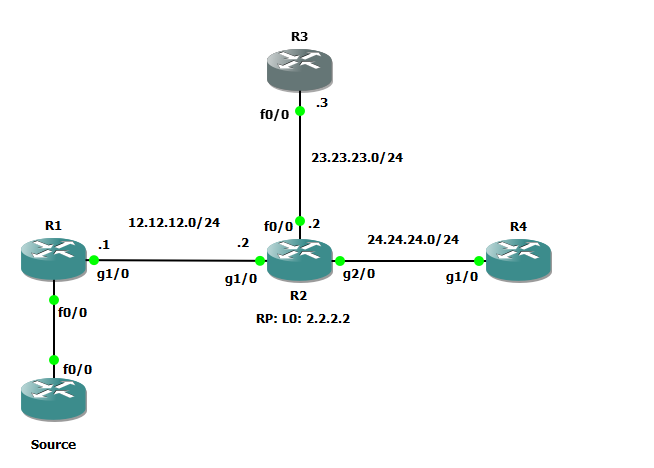 When a new source starts sending traffic to a multicast group address, the PIM DR (Designated Router) on the segment connected to the source will forward a PIM register message to the RP. This PIM register message contains the original multicast packet from the source, and it includes the IP address of the source and the destination multicast group address. We can configure our RP to filter certain sources, if we do this the RP will send a PIM register-stop message to the PIM DR so that it will not build the SPT towards the source. Just a simple PIM sparse mode setup where R1 is the RP. By default all sources and all multicast groups are allowed to register at the RP. I setup up lab for 4 routers to allow one router and block other router, it’s not working, but for two routers like your lab its working. in this LAB I want to filter R1 as source to R4 which is configured group address 239.9.9…9, but its allowing all sources. from R2 (Which is the RP), but even though I’m receiing INVALID-Source address its still allowing to ping the group address and even setting up in multicast routing. Why its accepting R1 as source and not accepting Source Router as Source ? is this means that if the DR it self generates multicast traffic as source, the Pim Accept Register will not effect it?. It’s probably because the pings are sent from the G1/0 interface on the R1 router. When R2 doesn’t accept 12.12.12.1 as a source, it sends a prune message to R1 so that it doesn’t forward this multicast traffic anymore. R1 however, is sourcing the traffic from its G1/0 interface so it’s not “multicast routed”. If you source the multicast traffic from a loopback interface on R1 that isn’t permitted on the access-list of R2, you’ll see that R1 no longer forwards it on its G1/0 interface because of the pruning.